The omnipresent and evergreen sector has been a key driver of global growth across sectors, countries, and economies. International trade forms the backbone of every major economy in an interconnected world, and supply chain management, the innately and incredibly complex web of transactions across suppliers, buyers, distributors, shippers, and agents, is an industry at the cusp of a silent revolution and at its crux is the blockchain phenomenon. Since its inception and throughout its evolution, delivering value, enhancing operating efficiencies, minimizing duplication of transaction records and minimizing costs on the part of every stakeholder in the value chain has been the coveted yet elusive goal in supply chain management. Today, the second biggest sectoral impact potential that blockchain is hailed to have in any industry after finance, is in supply chain management and logistics. Much has been written, in terms of course materials for supply chain operations for professionals and industry body reports, including a whole barrage of transformation ideas by management consultants worldwide. This has not, however, done anything to ease the pain that the global supply chain management sector faces – digitization of a company’s supply chain alone accounts for more than a 70% plus increase in cost efficiencies. Cross border payments, which flow in almost the same frequency in reverse to that of shipping, are another major area with several sinkholes, draining almost $1.6 trillion per annum, across the industry. Supply chain managers are in search of a failsafe, unified solution that will ensure smooth operations, with 39% of supply chain managers stating operational hindrances were largely caused by inadequate technologies. The loss of $223 billion that is owed to redundant or conflicting transactional data every year is yet another red flag. The sign of the times warrant an urgent transformation into a secure, streamlined, immutable and irrefutable real-time data processing and sharing technology that would also facilitate forecasting and analytics, while decentralized applications built on the blockchain ecosystem will drive anytime anywhere user accessibility. Combine this with the already existing technology infrastructure like ERPs and RFIDs and it is easy to see why blockchain is, quite simply, the future of most innovations in supply chain management. Duplicate records of transactions and inventory items are a major complication in inventory management, one of the crucial components of supply chain management. Blockchain eliminates these discrepancies with élan. In a supply chain that uses blockchain, no two inventory items can have the same records in a common blockchain, and every single item in a supply chain’s inventory can be easily identified using singular, indelible transaction records. A single, shared record for every transaction on every inventory item will eliminate duplication and ensure tracking of each item with surgical precision. All data including costing, shipping and other overheads can be accurately tracked and measured, drastically improving the efficiency of the process. So much so that a staggering 90% of supply chain managers agree that real-time access to shipping and inventory data, coupled with optimized and enhanced information sharing systems would increase efficiencies across the supply chain – something that fits into the very nature of problems that blockchain implementations aim to solve. 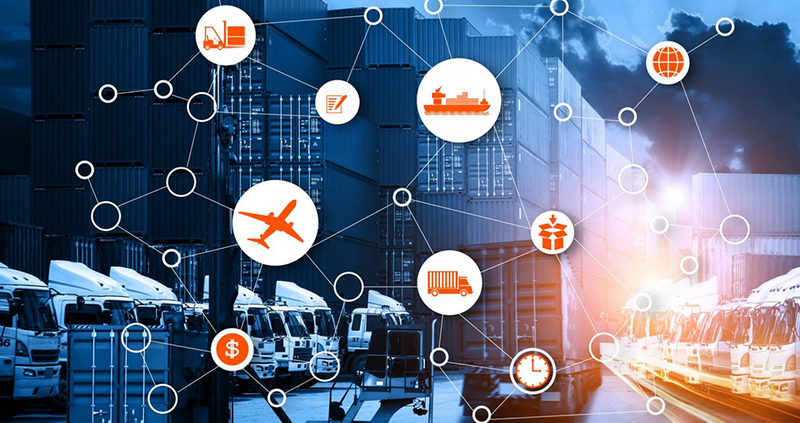 Increased visibility of every item across the global supply chain has the potential to provide a windfall for all parties concerned with efficiencies derived from optimized operations and the resultant cost benefits. With real-time data, come analytics that are accurate and enhance visibility and predictability in inventory planning, transport and warehousing management. Demand forecasting also becomes easier and far more accurate in nature. With accurate data to analyze, every form of prescriptive, descriptive and predictive analytics work in sync to provide unprecedented accuracy in every function of the supply chain that all stakeholders can use to leverage higher ROI from their SCM initiatives. More than 38% of supply chain managers agree that on-time payments will ensure a better and stronger relationship with vendors and shipping providers. Smart contracts, one of the essential elements of the blockchain ecosystem, has the power to resolve this bottleneck. Conditional executable codes for payment, which act as digital escrows until all prerequisite conditions are met, and execute instantly when they do, can streamline the entire payment process in the global supply chain, delivering precise payment solutions to vendors and transport providers alike. In fact, the use of smart contracts for payments upon preset conditions is touted to be the next immediate big step of blockchain implementations in global supply chain management. Supply chain automation powered by smart contracts hold so much promise of efficient and accurate payment solutions that middlemen and intermediary institutions have hitherto not been able to match, and most likely never will. Transparency, interoperability, and longevity of transaction related data across the entire supply chain hold the promise that the big players have been seeking in their supply chains all along. No wonder then, that companies like Walmart, IBM, Maersk, Nestle, Carrefour and even BHP Billiton, the world’s largest mining company, have all been running pilot projects for the implementation of blockchain in their supply chains. DeBeers has been using blockchain technology to ensure that the stones they sell are not in any way ‘blood diamonds’, keeping a track of every diamond mined right up to the point of sale. This has led to a massive explosion in the need for proficient blockchain engineers within this segment alone, in recent times. Industry experts have claimed that blockchain holds the promise to turn the global supply chain into a demand chain, and several blockchain based logistic startups are already running multiple service projects. You can’t ignore an inventory item that’s recorded on the blockchain, the saying goes. Imagine a world with zero goods lost in transit and zero payment flow delays with self-executing smart contracts vis-a-vis the current scenario where accounts receivables that were supposed to be payment-on-delivery age up-to 60 days overdue. That’s the phenomenal power of the blockchain in supply chain management, and the industry is only scratching the surface of its full potential as newer use cases spring up across the world.